Born in Switzerland, but currently residing in New York, saxophonist and composer Maria Grand is an integral part of the New York modern creative jazz scene. Grand’s debut release, Tetrawind is a socially charged offering that propositions thought provoking music and a type of lyrical poetry within the music itself. Joined by: Román Filiú on alto saxophone and flute, David Bryant on keyboards, Rashaan Carter on electric bass and Craig Weinrib on drums. Grand has composed four compositions themed on the four compass directions “East,” “North,” “South,” and “West.”. Her playing is lyrical, yet charged with passion and grit. Her writing is creatively complex harmony, paired with compositional maturity, that offers a solid pantheon of modern creative improvisational stylings. To put it plainly, she is the “real” deal. “East (Land of the Living)” creates a moody vamp that springs into action. Grand colorizes with muscular lines squarely in the modern jazz moniker. Her brand of commanding playing immediately sets up the proceedings for the listener, displaying her prowess as a player that knows her brand well. Weinrib and Grand interact well, her lines flow into Weinrib as a tight interaction that connects to Bryant’s solo, that offers a melodically rich solo, filled with motifs and supportive interaction. That being said, Carter should not be left out of the mix, as his bass lines are equally up to the task and a sincere glue to the tune. Each tune is equally engaging, but it was the final track “West,” that truly caught my attention. “West” opens with Grand singing the melody with a harmonizer on her voice followed by the two saxophones playing the melody. Grand and Filiú take turns exchanging phrases, both are strong melodic players and interact with the rhythm section nicely. Eventually, the two are soloing at the same time which builds the energy and leads to the ending theme, which is eloquently played together. The opening melody followed by open solos, which leads to a different closing melody gives the composition: form, continuity, a fresh evolving sound, and a through-composed structure. The result is an interesting listen that is not your typical AABA format, with solos sandwiched between the two melody statements, making for a solid musical declaration! Grand is a shining example of an experimental saxophonist, but what takes her vibe even further is her poetic lyrical approach. You can clearly see why she has been featured on Steve Coleman’s recording; it is clear her directional compass is focused and clearly settled. She is not an emerging artist finding her direction, she is centered and driven towards her journey. Her rebel music, is matched with her defiant playing and socially consciousness messaging. 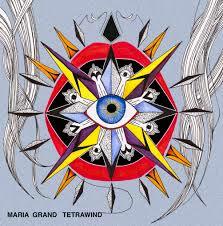 Be the first to comment on "Maria Grand | Tetrawind"